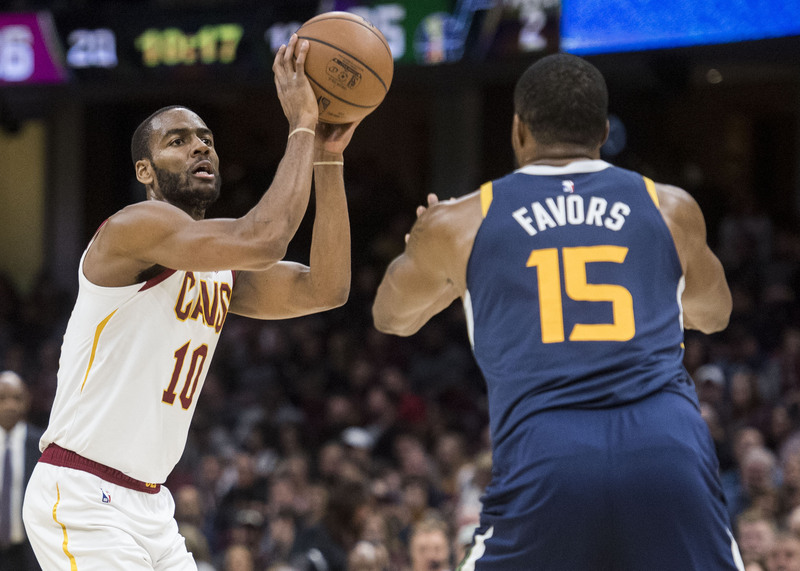 The Cleveland Cavaliers (9-36) have traveled to Salt Lake City to take on the Utah Jazz (21-25) at Vivint Smart Home Arena, in what’s a special affair for Cavs guards Rodney Hood and Alec Burks. However, just as importantly, Friday’s matchup against Utah gives Cleveland the chance to steal a game against an opponent that may be on five-game win streak have only three teams in playoff-contention (the Los Angeles Clippers, Los Angeles Lakers and Detroit Pistons) in that span. That said, though the Jazz’s win streak isn’t as impressive when looking at who’ve they’ve defeated (add the Chicago Bulls and Orlando Magic to the aforementioned three teams), Utah is as well-coached a team in the NBA under head coach Quin Snyder. Add that they’re led by a talented and explosive guard in Donovan Mitchell as well as a perennial Defensive Player of the Year candidate and rebounding machine in Rudy Gobert and it’s clear why Utah is a team on the brink of a breakout should they add one more piece. They’ll be without two rotation players in floor general Ricky Rubio and fellow point guard Dante Exum. Furthermore, point guard Raul Neto is out. That should have an obvious effect on their execution throughout the game, allowing Cleveland to increase their own margin for error, as they’re down four rotation players (Tristan Thompson, Kevin Love, Larry Nance Jr. and David Nwaba). To defeat the Jazz, the key is minimizing the impact those two players make. Burks, who Cavs head coach Larry Drew has tasked with being the team’s defensive stopper, will likely draw the assignment against Mitchell (who’s taking a team’high 6.8 three-point attempts per game) and allows rookie point guard Collin Sexton — who has been inconsistent with his defense against quick and athletic point guards — to defend Royce O’Neal. O’Neal (6-foot-6, 226 pounds) is much larger than Sexton (6-2, 190 pounds). However, O’Neal only averages 4.4 points per game and operates mainly as a three-and-D player, making defending him a much easier task. Unfortunately, there doesn’t seem to be a way Cleveland to create an advantage in the frontcourt, given Gobert’s combination of length, athleticism and defensive ability in contrast to either Ante Zizic or Channing Frye’s lack of foot speed although Frye does have the advantage of being able to bring Gobert out of the paint because he’s a legitimate three-point threat. This will be the Cavs’ biggest area of concern and players will have to constantly be ready to help Zizic by digging in or doubling him on the roll, hoping to turn the Steiffel Tower into a passer. Gobert had a career-high 8 assists in a narrow win against the Bulls during their streak. Jazz forward Joe Ingles — who has started to make a name for himself in the league — is certainly a player to watch, considering his feel for the game, basketball IQ and most importantly three-point stroke. The Aussie, a career 40.6 percent shooter from three-point range, is knocking down 36.5 percent of his shots from deep this season. On a team that gets up plenty of three-point attempts (32.8 per game, ranked eighth in the NBA) — which opens up space for Mitchell to attack — Ingles has the fourth-highest three-point percentage for Utah. In the end, the game could come down to the decisions made by both teams down the stretch. The Jazz, who average 15.0 turnovers per game (ranked 26th in the NBA) are still led by a second-year player, no matter how talented, and Mitchell is averaging 2.8 turnovers per game (ranked second on the Jazz). Forcing him into making hasty decisions or simply playing off of his bad tendencies — which Burks and Hood should be well aware of — may prove essential for Cleveland. The Cavs are, as has been well-documented, a young and inexperienced team that’s still trying to learn what it takes to learn consistently at the NBA level. Tonight gives them another opportunity to show that they’re progressing and that this season, which many feel has been a loss for whatever reason, will actually be instrumental in their future success. Cleveland has worked all season on removing bad habits built up from their four past Finals-bound seasons, an unfortunate byproduct of the Cavs’ tendency to seem as if they were sleepwalking through the regular season in anticipation of the postseason. For four years, they haven’t been sharp in the small but important areas of ball-movement, body movement, consistent effort. Extra effort. Unfortunately for Cleveland, it has shown. Especially with a team with far less top-end talent and experience than they’ve had in seasons past. On Friday night, the Cavs get a chance to have more than moral victory if they can put together a full 48-minute performance. How to watch: FOX Sports Ohio — Tip-off at Vivint Smart Home Arena (Salt Lake City, Utah) set for 9:00 ET.